Variations in criteria regulating treatment with reimbursed biologic DMARDs across European countries. Are differences related to country's wealth? Objectives To explore criteria regulating treatment with reimbursed biologic disease-modifying antirheumatic drugs (bDMARDs) in patients with rheumatoid arthritis (RA) across Europe and to relate criteria to indicators of national socioeconomic welfare. Methods A cross-sectional study among 46 European countries. One expert from each country completed a questionnaire on criteria regulating the start, maintenance/stop and switch of reimbursed bDMARDs. A composite score was developed to evaluate the level of restrictions in prescription of a first bDMARD (0=highly restricted, 5=most liberal). The level of restrictiveness was correlated with national socioeconomic welfare indicators. Results In 10 countries (22%), no bDMARD was reimbursed. Among 36 countries with at least one biologic reimbursed, 23(64%) had no requirement for disease duration to initiate a biologic. Half of the countries required a failure of two synthetic DMARDs to qualify for therapy. 31 countries specified a minimum level of disease activity to be fulfilled and in 20 (56%) countries cut-off for disease activity score with 28-joint assessment was higher than 3.2. Four countries (11%) had the maximum composite score (most liberal) and 20 (56%) scored between 0 and 2 (more restrictive). Criteria for initiation of a bDMARD were negatively associated with countries’ socioeconomic welfare (−0.34 to −0.64), and a moderate positive correlation was found between the composite score and welfare indicators (0.59–0.72). Only some countries had regulations for stopping (n=14(39%)) or switching (n=19(53%)). Conclusions Clinical criteria regulating prescription of bDMARDs in RA differ significantly across Europe. Countries with lower socioeconomic welfare tend to have stricter eligibility criteria, pointing to inequities in access to treatment. We previously reported that access to conventional treatment as well as biological treatment across each dimension of access (availability, affordability and acceptability) was more limited in countries with lower socioeconomic welfare.4 ,5 Access to therapy was operationalised through system characteristics (eg, price of bDMARDs, date of reimbursement), while clinical criteria regulating therapy were not covered.4 Discrepancies in these criteria can contribute to inequalities in access and consequently uptake of medications and health outcomes. In 2009, Emery et al reviewed the clinical guidelines for eligibility of patients with RA for treatment with biologics in 10 European countries and confirmed large variations across countries, particularly in terms of disease duration and disease activity level required for initiation of anti-tumour necrosis factor-α therapy.6 This review included clinical guidelines published before 2007 and was limited to a relatively small number of countries from the European Union. Nowadays, more biologics are available for the treatment of RA, making it important to also gain insight into criteria to stop and switch between bDMARDs, and to explore the possible existence of a maximum number of bDMARDs that can be prescribed to one patient. Moreover, no attempt has until now been made to link variation in regulations to start a bDMARD and the level of socioeconomic welfare of the country and the uptake of bDMARDs or RA-related health status in that country. The objective of the present study was therefore to review the criteria regulating treatment with bDMARDs (including start and maintenance) in patients with RA across the entire European Region, relate them to indicators of national socioeconomic welfare and shed light on potential impact of these criteria on uptake of treatments and health outcomes. Data on the eligibility for initiation and maintenance/stop or switches between bDMARDs in patients with RA were collected, as of May 2011, by a rheumatologist or an expert from each country. Answers were carefully checked and collaborators were contacted to confirm the results. First, experts were asked whether at least one bDMARD was reimbursed. For those countries confirming an official reimbursement, medical specialties authorised to prescribe biologics to patients with RA were identified, as well as whether either reimbursement criteria or clinical recommendations (or both) were predominantly regulating prescription. Further, information was collected on the following requirements before starting a bDMARD (if applicable): (a) minimal disease duration; (b) failure of synthetic DMARDs (sDMARDs), including type, number and length of treatment; and (c) clinical criteria, such as level of disease activity where applicable (eg, disease activity score with 28-joint assessment—DAS287). Finally, questions were asked on (a) time point to assess response; (b) requirements to alter the frequency and/or dose of a biologic; (c) criteria to stop (or maintain, as reported) therapy with biologics; (d) criteria to switch between agents; (e) existence and (if applicable) frequency of official controls on the adherence to the reimbursement criteria; and (f) maximum number of biologics that could be tried on one patient. The individual criteria to assess eligibility for a first biologic (disease duration, disease activity level and number of sDMARDs to be failed) were inspected and categorised into two or three broad groups so that the most frequent patterns could be identified (tables 1 and 2). In order to compute this composite score, requirement for a specific disease duration was categorised as ‘any requirement’ (0 point) or ‘no requirement’ (1 point); the number of sDMARDs to be failed as ‘more than two’ (0 point), ‘two’ (1 point) and ‘less than two’(2 points) and the level of disease activity (based on the level of DAS28 since this appeared to be the criterion applied by most regulations) as ‘DAS28 cut-off >3.2 or its equivalent’ (0 point), ‘DAS28 cut-off ≤3.2 or its equivalent’ (1 point) and ‘no requirement’ (2 points). In addition, a composite score was computed for each country, which was the simple sum of the scores on the individual criteria and varied between 0 and 5; the higher the score, the easier the access. Criteria for stop/maintenance (at 6 months), switch and change of frequency/dose were also categorised after inspection into broad groups to reflect the patterns (table 3). Data were analysed for all countries using descriptive statistics. Score on the individual criteria (original values) and composite index were compared between the 27 EU and the 9 non-EU countries by means of Mann–Whitney U test (skewed distribution). The association between the sources of prevailing regulation (only reimbursement criteria, only clinical recommendations or both) and the frequency of controls on prescriptions from the regulating agencies was investigated through χ2 test. Correlations (Spearman) were first established between the individual criteria for initiation of a first bDMARD and, next, between the crude individual criteria and the composite score with (a) indicators of socioeconomic welfare; (b) uptake of bDMARDs; and (c) indicators of RA health status. Analysis was done for all countries and EU countries separately. Coefficients >0.5 but ≤0.80 were assumed to be moderate and >0.8 strong.13 SPSS V.19.0 was used. In total, 46 countries (response rate 94%) provided data. An overview of the clinical criteria for eligibility and maintenance of biologic in each of the countries is presented in table 1. In 10 countries (22%), no bDMARD was reimbursed. Among the remaining 36, Luxemburg had no regulation for the start of a reimbursed bDMARD, in 11 (31%) reimbursement criteria were the major source of eligibility criteria, while in 7 (19%) clinical recommendations predominated and in 16 (44%) both reimbursement criteria and clinical recommendations were used (usually because they were similar or clinical criteria complemented reimbursement criteria) for decisions to start a biologic (table 1). Albania had no written source of regulation but reported the criteria used in practice. Countries differed with respect to frequency of controls of the adherence to formal recommendations. Thirteen countries (36%) reported controls were ‘frequent’ or ‘always’, in 17 countries (47%) controls were ‘rare’ or ‘sometimes’ and respondents from six countries (17%) reported no controls of adherence to existing criteria. No association between the type of prevailing regulation (ie, reimbursement criteria, clinical recommendations or both) and reported frequency of controls was detected (p=0.43). In 24 countries (67%), only rheumatologists had permission to prescribe bDMARDs to patients with RA, while in the rest other specialties such as Dermatology (22%), Gastroenterology (22%), Internal medicine (25%), General practice (11%) and other (14%) were similarly entitled to prescribe (table 1). Among 36 countries with at least one biologic reimbursed, 23 (64%) had no requirement on disease duration to initiate a bDMARD, while for the remaining countries the prespecified minimum duration ranged from 3 to 12 months. With respect to the number of sDMARDs to be failed, the most common criterion (n=18(50%)) was the failure of two DMARDs. A minimum level of disease activity or severity was mandatory in 31 (86%) countries but was not specified in Germany, Ireland, Luxemburg, Malta and Switzerland. In 11 countries (31%), patients with a DAS28 of 3.2 qualified to obtain access to bDMARDs, but in 20 countries (ie, over 50%) this requirement was stricter than a DAS28 of 3.2 (or equivalent), meaning that the cut-off to start a biologic was higher than 3.2 (tables 1 and 2). The timing for the first assessment of response was specified in 29 countries and varied from 9 to 24 weeks, with 16 countries defining this period as 12 weeks. Fourteen countries (39%) reported to have specific criteria to stop bDMARD before or at 6 months due to inefficacy (or for maintenance, from which stop criteria were extrapolated) (table 3). Of those, 11 (31%) required a minimum improvement in terms of disease activity (improvement of 1.2) before or at 6 months for therapy to be continued. Five of these countries (14%) required in addition a prespecified minimum level of disease activity to be achieved and this level corresponded to low disease activity (ie, DAS28 of 3.2) in four of them. More than half of the countries (n=19, 53%) reported there were specific criteria for switching. These criteria included a minimum level of disease activity (n=11, 31%) and/or failure to reach a minimum improvement in disease activity (n=10, 28%). Half of the countries (n=18, 50%) had some regulation regarding the possibility to change the frequency and/or dose of a biologic (table 3). So far, no country introduced a maximum number of biologics that can be prescribed to one patient. As for the composite score for clinical eligibility criteria that was based on the three criteria to initiate a bDMARD, 4 countries (11%) had the maximum (5) eligibility score (most liberal), 12 countries (33%) had score 3 or 4 and 20 (56%) scored between 0 and 2. Countries from Eastern Europe and Former Soviet Union were more likely to be classified in the more restricted scores (table 1, figure 1). Composite score for restrictiveness of clinical criteria for initiation of a first reimbursed biologic (0–5) in the European Region (score is composed of (1) minimum required disease duration, (2) number of sDMARDs that have to be failed and (3) the level of DAS28). DAS28, disease activity score with 28-joint assessment; sDMARDs, synthetic disease-modifying antirheumatic drugs. AL, Albania; AT, Austria; BE, Belgium; BG, Bulgaria; HR, Croatia; CY, Cyprus; CZ, Czech Republic; EE, Estonia; FI, Finland; FR, France; DE, Germany; DK, Denmark; GR, Greece; HU, Hungary; IS, Iceland; IE, Ireland; IT, Italy; LV, Latvia; LT, Lithuania; LU, Luxemburg; MK, Macedonia; MT, Malta; ME, Montenegro; NL, the Netherlands; NO, Norway; PL, Poland; PT, Portugal; RO, Romania; RS, Serbia; SK, Slovakia; SL, Slovenia; ES, Spain; SE, Sweden; CH, Switzerland; TR, Turkey; UK, United Kingdom. The results for the eligibility for a first bDMARD did not differ significantly between the 27 EU and 9 non-EU members, neither for the individual criteria nor for the composite score (data not shown). The three individual clinical criteria to start a bDMARD were positively but weakly correlated with each other (Spearman coefficients 0.23–0.43), with the strongest association between the required level of disease activity and the number of sDMARDs to be failed (data not shown). The level of DAS28 required before starting a bDMARD was moderately negatively associated with socioeconomic indicators (figure 2), weakly positively with the indicators of health status of RA patients and weakly negatively with the uptake of bDMARDs. The number of sDMARDs to be failed and requirement for minimum disease duration followed similar patterns (table 4). 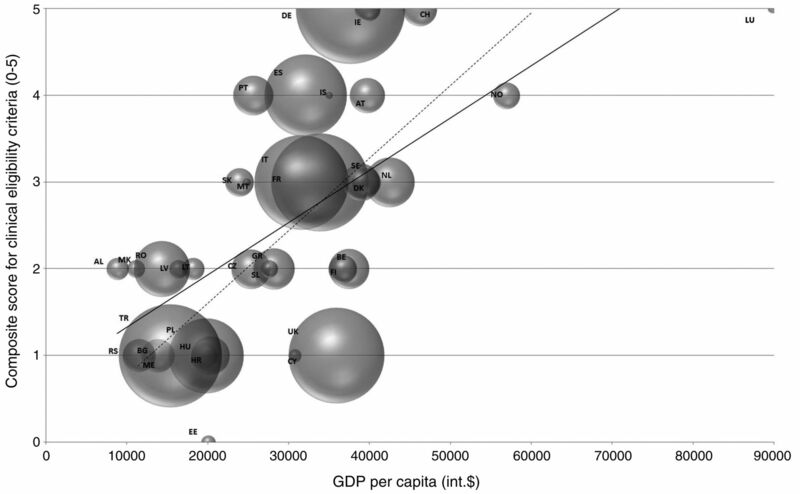 Composite score for restrictiveness of clinical criteria (0–5) and GDP per capita (int/$), n=36. Size of the bubble is proportional to the population size of each country. Dashed trend line is added to show the linear trend if without data from Luxemburg, which can be considered an outlier GDP, gross domestic product. AL, Albania; AT, Austria; BE, Belgium; BG, Bulgaria; HR, Croatia; CY, Cyprus; CZ, Czech Republic; EE, Estonia; FI, Finland; FR, France; DE, Germany; DK, Denmark; GR, Greece; HU, Hungary; IS, Iceland; IE, Ireland; IT, Italy; LV, Latvia; LT, Lithuania; LU, Luxemburg; MK, Macedonia; MT, Malta; ME, Montenegro; NL, the Netherlands; NO, Norway; PL, Poland; PT, Portugal; RO, Romania; RS, Serbia; SK, Slovakia; SL, Slovenia; ES, Spain; SE, Sweden; CH, Switzerland; TR, Turkey; UK, United Kingdom. The composite score was moderately positively associated with socioeconomic welfare and weakly to moderately negatively with the indicators of health status. Importantly, the composite score correlated moderately positively with the available data on the uptake of biologics. When analyses were limited to the 27 EU member states, correlations were weaker but the direction of the associations persisted (table 4). Strikingly, in more than half of the countries (56%) the cut-off for the DAS28 as a criterion to start the first biologic was stricter than 3.2 (DAS28≥3.2). Furthermore, 13 countries (36%) required a minimum disease duration and 22 (61%) specified that more than one sDMARDs had to be failed before a bDMARD can be initiated. Within the limitations of availability and generalisability of data on medication uptake and RA health status across countries, our findings are alarming as stricter clinical eligibility criteria seem to also be associated not only with lower uptake of biologics, but also with higher disease activity, thus suggesting that principles of equitable heathcare systems might be undermined within Europe. This finding was similar in EU and non-EU countries. In conclusion, the socioeconomic welfare of a country is associated with the strictness of eligibility criteria stated in national regulations to prescribe reimbursed treatment with bDMARDs. This becomes unfair when universal right to healthcare is increasingly influenced by pure financial considerations, and patients in countries with lower budgets have stricter clinical requirements to initiate a treatment that would be clinically recommended at earlier stage. However, the problem is complex and has to be treated within the national priorities on public health agenda. We acknowledge all the individuals with whom we discussed the ideas presented in this manuscript and who have helped us in any way to complete this project. In particular, we express our gratitude to Argjent Tafaj (Albania), Louis Van Praet (Belgium), Sevdalina Lambova (Bulgaria), Ulla Ege Johansen (Denmark), Laszlo Gulacsi (Hungary), Oliver FitzGerald (Ireland), Casabella Andrea (Italy), Liliana Groppa (Moldova), Piotr Głuszko (Poland), Ruxandra Ionescu (Romania), Jozef Rovensky (Slovakia), Elisabet Lindqvist (Sweden) and Oleg Nadashkevich (Ukraine).
. Improvement of work ability, quality of life, and fatigue in patients with rheumatoid arthritis treated with adalimumab. J Occup Environ Med 2010;52:618–21.
. Newer biological agents in rheumatoid arthritis: impact on health-related quality of life and productivity. Drugs 2010;70:121–45.
. Out-patient drug policy by clinical assessment rather than financial constraints? The gate-keeping function of the out-patient drug reimbursement system in The Netherlands. Eur J Health Econ 2004;5:274–7.
. Inequities in access to biologic and synthetic DMARDs across 46 European countries. Ann Rheum Dis 2014;73:198–206.
. Disparities in rheumatoid arthritis disease activity according to gross domestic product in 25 countries in the QUEST RA database. Ann Rheum Dis 2009;68:1666–72.
. Guidelines for initiation of anti-tumour necrosis factor therapy in rheumatoid arthritis: similarities and differences across Europe. Ann Rheum Dis 2009;68:456–9.
. Modified disease activity scores that include twenty-eight-joint counts. Development and validation in a prospective longitudinal study of patients with rheumatoid arthritis. Arthritis Rheum 1995;38:44–8.
. Measurement of patient outcome in arthritis. Arthritis Rheum 1980;23:137–45.
. QUEST-RA: quantitative clinical assessment of patients with rheumatoid arthritis seen in standard rheumatology care in 15 countries. Ann Rheum Dis 2007;66:1491–6.
. Correlation and simple linear regression. Radiology 2003;227:617–22.
. Do we need guidelines to stop as well as to start biological therapies for rheumatoid arthritis? Clin Exp Rheumatol 2012;30:S21–6.
. EULAR recommendations for the management of rheumatoid arthritis with synthetic and biological disease-modifying antirheumatic drugs. Ann Rheum Dis 2010;69:964–75.
. Treating rheumatoid arthritis to target: recommendations of an international task force. Ann Rheum Dis 2010;69:631–7.
. Comparison of anti-TNF treatment initiation in rheumatoid arthritis databases demonstrates wide country variability in patient parameters at initiation of anti-TNF therapy. Semin Arthritis Rheum 2011;41:81–9.
. Small-area variations in sales of TNF inhibitors in Sweden between 2000 and 2009. Scand J Rheumatol 2011;40:8–15.
. An even smaller area variation: differing practice patterns among interventional cardiologists within a single high volume tertiary cardiac centre. Health Policy 2012;104:179–85.
. Impact of socioeconomic gradients within and between countries on health of patients with rheumatoid arthritis (RA): Lessons from QUEST RA. Best Pract Res Clin Rheumatol 2012;26:705–20.
. Effectiveness and efficiency of guideline dissemination and implementation strategies. Health Technol Assess 2004;8:iii–iv, 1–72.
. Comparison of recommendations for the use of anti-tumour necrosis factor therapy in ankylosing spondylitis in 23 countries worldwide. Rheumatology 2011;50:2270–7.
. Use of biological therapies in rheumatoid arthritis management: a comparison between the main worldwide and Brazilian recommendations. Rev Bras Reumatol 2011;51:220–30. Initiative Arznei&Vernunft Vernünftiger Umgang mit Medikamenten in Rheumatoider Arthritis, 2012. Guidelines treatment with disease modifying drugs in RA/Consensus-statement for B-cell modifying drugs/for T-cell modifying drugs National Austrian League of Rheumatology, 2006 (DMARDs RA) 2008 (B-cells)/2009 (T-cells). RIZIV (Rijksinstituut Ziekteverzekering), 2001 (updated in 2010). National guidelines for treatment of rheumatoid arthritis with biologic DMARDs, Bulgarian Scientific Society in Rheumatology, 2008. Recommendation for use of TNF blocking drugs in rheumatoid arthritis, Croatian Society for Rheumatology, 2007.
. [Proposal for biologic drugs therapy in rheumatoid arthritis]. Reumatizam 2010;57:29–35. Odluka o utvrđivanju Osnovne liste, lijekova Hrvatskog zavoda za zdravstveno osiguranje, 2010. A modified version of NICE guidelines, Cyprus Society for Rheumatology & Pharmaceutical Services of the Ministry of Health, 2007. Vencovsky J and the Czech Society of Rheumatology Committee. Safety of biological therapy—Guidelines of the Czech Society for Rheumatology, Ceska Revmatologie 2009;17:146–60.
. Recommendations of the Czech Society for Rheumatology for the treatment of rheumatoid arthritis, Ceska Revmatologie 2010;18:182–91. Dansk Reumatologisk Selskabs kliniske retningslinje for klassifikation diagnostik, behandling og monitorering af reumatoid artritis (RA) 2012. Eesti Haigekassa tervishoiuteenuste loetelu. https://www.riigiteataja.ee/akt/122122011042, 2011. Suomalaisen Lääkäriseuran Duodecimin ja Suomen Reumatologisen yhdistyksen asettama työryhmä Nivelreuma Päivitetty, 2009. Haute Autorité de Santé, 2007.
. [German 2012 guidelines for the sequential medical treatment of rheumatoid arthritis. Adapted EULAR recommendations and updated treatment algorithm]. Z Rheumatol 2012;71:592–603.
. Guidelines for the use of biological agent in the treatment of rheumatoid arthritis and spondyloarthritides. Hellenic Rheumatology 2008;19:291–310. Klínískar leiðbeiningar um notkun TNF-α blokkandi lyfja fyrir sjúklinga með iktsýki (rheumatoid arthritis/RA), 2009. Reumatológiai és Fizioterápisá Szakmai Kollégium. A Nemzeti Erőforrás Minisztérium szakmai protokollja az arthritisek kezeléséről szintetikus és biológiai betegségmódosító gyógyszerekkel. Egészségügyi Közlöny 2011;61:1503–20. Országos Egészségbiztosítási Pénztár. A rheumatoid arthritis diagnosztikájának és kezelésének finanszírozási protokollja (finanszírozási eljárásrend) Orvosszakértői és Szakmai Ellenőrzési Főosztály, 2010 (http://www.oep.hu/portal/page?_pageid=35,31793613&_dad=portal&_schema=PORTAL).
. Recommendations for the use of biologic therapy in rheumatoid arthritis: update from the Italian Society for Rheumatology I. Efficacy. Clin Exp Rheumatol 2011;29:S7–14. Biological disease-modifying antirheumatic drugs usage guidelines of autoimmune inflammatory arthritis in adults in Latvia Rheumatology society&Ministry of health, 2010. Guidelines for the use of Tocilizumab, Lithuanian Rheumatologist Association, 2011. Guidelines for the use of TNF blockers, Lithuanian Rheumatologist Association, 2007. Guidelines for the use of Rituximab, Lithuanian Rheumatologist Association, 2010. Macedonian criteria for inclusion of patients on biological therapy. University Rheumatology Clinic - Skopje, Macedonian Association Against Rheumatism - MAAR. Protocols for Etanercept, Infliximab and Rituximab. Montenegrin Society for Rheumatology and Montenegrin Section of Rheumatology. Recommendation for use of TNF blocking drugs in rheumatoid arthritis., Reumatoloski dani, Becici, 2011. Dutch Society for Rheumatology in collabortation with Nederlandse Vereniging voor Dermatologie en Venereologie (NVDV), Nederlands Genootschap van Maag-Darm-Leverartsen (NGMDL), Nederlandse Vereniging van Artsen voor Longziekten en Tuberculose (NVALT). Use of biologicals, Nederlandsche Internisten Vereniging (NIV) Reumapatiëntenbond with support of Afdeling Ondersteuning Professionele Kwaliteit van de Orde van Medisch Specialisten, 2003. Nasjonale faglige retningslinjer for bruk av TNF-α hemmere og andre biologiske betennelsesdempende legemidler innen revmatologi god. Revidert utgave februar 2010. Første utgave 06/2007, revidert 12/2009. Official translations of the EULAR recommendations, Medycyna Praktyczna, 2010. Portuguese Society for Rheumatology. Portuguese Guidelines for the Use of Biological Agents in Rheumatoid Arthritis. http://www.spreumatologia.pt Acta Reumatol Port, 2003. Internal use guidelines, Speciality Consultative Commissions of the Ministry of Health (MofH), 2010. The Ministry of Health Republic of Serbia, Medical association of physicions, Rheumatology society. Rheumatoid arthritis, national guideline for physicions in primary health protection, 2005. Rheumatology society, The Ministry of Health Republic of Serbia. Rheumatoid arthritis, national guideline for physicions in primary health protection. Criteria of the Commission of the Republic Health Insurance Fund for approving the use and provision, The Ministry of Health Republic of Serbia, Medical association of physicions, 2005. The EULAR recommendations for RA management with synthetic and biological DMARDS (translated into Slovak language with permission of prof. Josef Smolen and the editors of Annals of Rheumatic Diseases), 2010. Practice Guideline for RA (GUIPCAR), Spanish Society for Rheumatology (Sociedad Española de Reumatologia; SER), 2011. Tornero Molina J, Sanmartí Sala R, Rodríguez Valverde V, et al. Actualizacion del documento de consenso de la Sociedad Española de Reumatología sobre el uso de terapias biológicas en la artritis reumatoide. Reumatol Clin 2010;6:23–36. Nationella riktlinjer för rörelseorganens sjukdomar. Osteoporos, artros, inflammatorisk ryggsjukdom och ankyloserande spondylit, psoriasisartrit och reumatoid artrit Stöd för styrning och ledning, 2012. The National guidelines for Musculoskeletal Diseases 2012—summary (http://www.socialstyrelsen.se), 2012. Compendium Suisse des Médicaments 2011 Remicade, Documed SA, 2011. List of medical preparations (http://bag.e-mediat.net/SL2007.Web.External/ShowPreparations.aspx), The Federal Health Agency (BAG), 2007. Reimbursement rules, Ministry of Labour and Social Security, 2011. NICE guidance on biologic drugs for the treatment of rheumatoid arthritis. National Institute for Health and Clinical Excellence, 2010. BSR Principles for Biologic Prescribing, The British Society for Reumatology, 2010. Contributors AB conceived the idea for the article and outlined the study design; PP, SR, TK, TS, TU and AB contributed to data collection; PP, SR and AB were involved in data analysis and interpretation. Figures were developed by PP, SR and AB, and the manuscript was drafted by PP, SR, TK, TU and AB. All authors have critically reviewed the final draft. Collaborators All members of Working Group ‘Equity in Clinical Eligibility Criteria for RA treatment’, namely Ledio Collaku (Albania), Ruzanna Harutyunyan (Armenia), Helga Radner (Austria), Nikolay Soroka (Belarus), Herman Mielants (Belgium), Sekib Sokolovic (Bosnia and Herzegovina), Lyubomir Sapundzhiev (Bulgaria), Miroslav Mayer (Croatia), Paraskevi Charalambous (Cyprus), Jiri Vencovsky (Czech Republic), Merete Lund Hetland (Denmark), Tõnu Peets (Estonia), Bruno Fautrel (France), Khatuna Letsveridze (Georgia), Ulf Müller-Ladner (Germany), Prodromos Sidiropoulos (Greece), Márta Péntek (Hungary), Gerdur Gröndal (Iceland) Fiona McGrehan (Ireland), Seriolo Bruno (Italy), Togizbayev Galymzhan (Kazakhstan), Daina Andersone (Latvia), Irena Butrimiene (Lithuania), Marco Hirsch (Luxemburg), Snezana Misevska-Percinkova (Macedonia), Karen Cassar (Malta), Elena Deseatnicova (Moldova), Dusan Mustur (Montenegro), Filip Raciborski (Poland), Viviana Tavares (Portugal), Florian Berghea (Romania), Ivan Shirinsky (Russia), Miodrag Veljkovic (Serbia), Maria Kovarova (Slovakia), Matija Tomsic (Slovenia), Francisca Sivera (Spain), Ingemar Petersson (Sweden), Axel Finckh (Switzerland), Shaydullo Sharipov (Tajikistan), Nevsun Inanc (Turkey), Tatyana Dumenko (Ukraine), Suzanne Verstappen (UK), Hojimurad Khudoberdiev (Uzbekistan) have contributed with corresponding country-specific data, provided additional insights and necessary clarifications about the national data and critically reviewed the interpretation of the results as well as the final draft of the manuscript. Competing interests Polina Putrik was supported by High Potential Scholarship awarded by Maastricht University. Sokka Tuulikki received grants from Abbott, Academy of Finland and Central Finland Health Care District; Sofia Ramiro was supported by the Fundação para a Ciência e Tecnologia (FCT) grant SFRH/BD/68684/2010; Tore K Kvien has received honoraria and research support from Abbott, BMS, MSD/Schering-Plough, Pfizer/Wyeth, Roche and UCB; Till Uhlig has received honorary/support for travel from Abbott, BMS, MSD, Pfizer and UCB; and Annelies Boonen received project grants from Amgem, Abbott and MSD and honoraria from UCB, Abbott and Pfizer. Correction notice This article has been corrected since it was published Online First. The collaborators and contributors sections have been amended.